(April 28, 2014­ Boston, MA): Democratic Candidate for Lt. 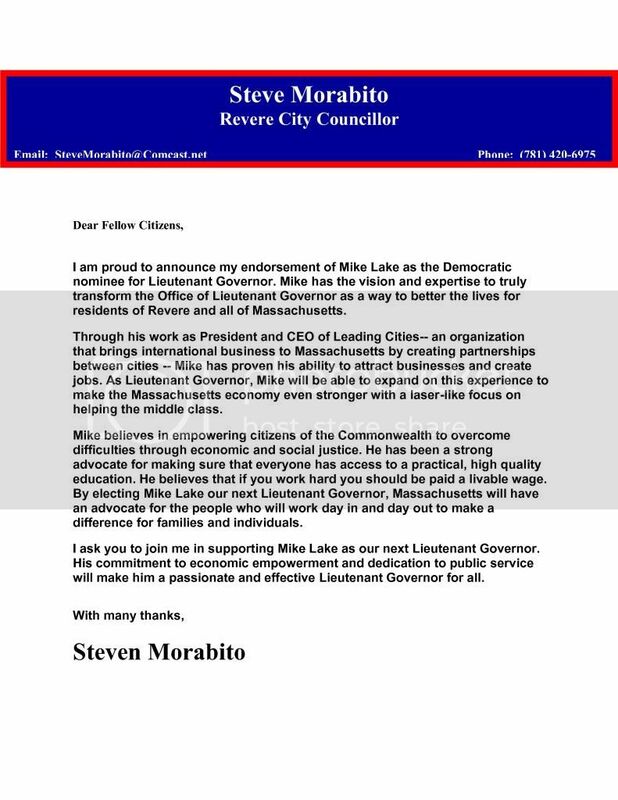 Governor Mike Lake was officially endorsed by Revere City Councilor Steve Morabito this week. In his endorsement, Councilor Morabito cited Lake’s ability to attract businesses to Massachusetts and better the lives for the middle class. Morabito praised Lake’s progressive values and specifically highlighted his advocacy for a higher minimum wage. Morabito argued that Lake would transform the Office of Lieutenant Governor into one that is accessible to the people of the Commonwealth. “Mike believes in empowering citizens of the Commonwealth to overcome difficulties through economic and social justice. By electing Mike Lake our next Lieutenant Governor, Massachusetts will have an advocate for the people who will work day in and day out to make a difference for families and individuals,” Morabito said. “I am honored to have the support of Councilor Morabito. He has been an effective champion for the middle class and has worked to create opportunities for families in Revere,” Lake said. “I look forward to working with Councilor Morabito to bring more jobs to Revere and the region.